Perhaps a mild upside edge could be found, but certainly nothing as compelling as last week's study. Results were volatile as well, with the average intraday drawdown over 1.6% and the average run-up over 2%. 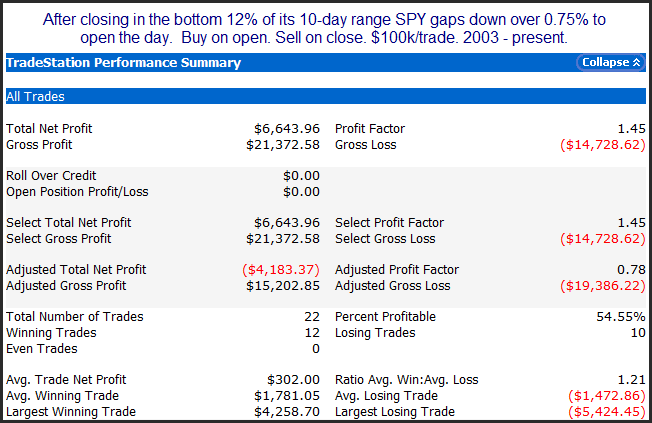 Below I tightened the requirements to a 1% gap and showed all instances. Results were similar - just with fewer instances. Of course gaining a better understanding of how futures may be used to gauge expectations doesn't mean you want to actually do the calculations. Fortunately, they do them for you. The link below is updated daily and shows estimates for meeting outcomes. Of course even if you know what the Fed is going to do with rates, that doesn't tell you any probabilities or edges related to market reaction and behavior on or around these meetings. For that information, you'll need to read "The Quantifiable Edges Guide to Fed Days". The next Fed Day is tomorrow, June 23rd. The guide is available in ebook or paperback. If you would prefer the paperback, but want to read it tonight, just email your purchase receipt before tomorrow's meeting and I'll send you the ebook version. Yesterday's SPY Action Suggesting More Selling? It's quite rare for the market to 1) gap up large and then 2) close down on the day BUT 3) a good distance off its lows. 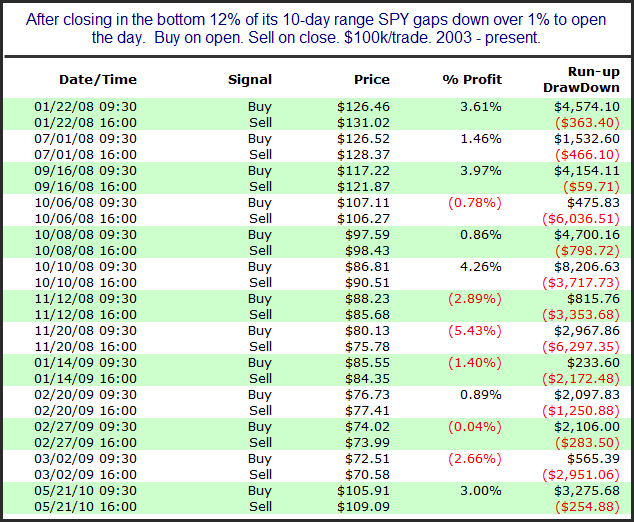 Yesterday the SPY didn't even close in the bottom 25% of its daily range. Even bounces much smaller than yesterday's late day bounce can take some of the positive energy away from the next day. In last night's Subscriber Letter I loosened the parameters a bit and still was presented with a rare but fairly compelling setup. Indications were bearish over the next few days, with 2 and 3-day exits both showing all 7 previous instances with negative returns. 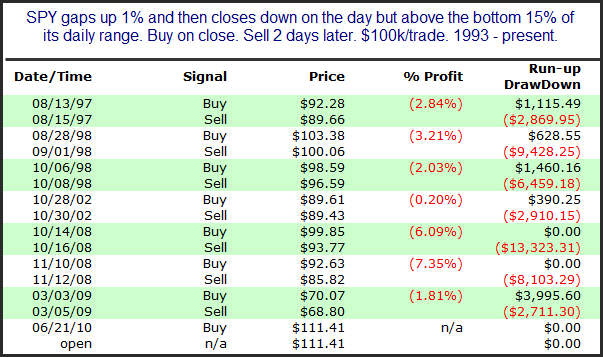 Below I show all trades using a 2-day exit. Looks like there is going to be a sizable gap up this morning. 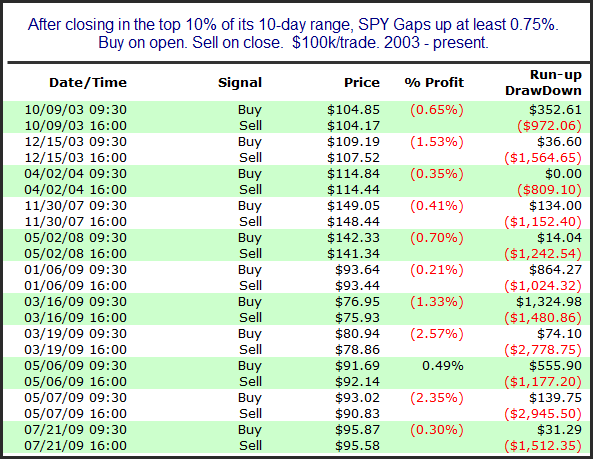 I've shown before how large gaps up from 10 and 20-day highs in the SPY often lead to an intraday selloff. While the SPX closed at a 20-day high on Friday, the SPY and the futures were down slightly. Rather than a stats table, I've listed below all 11 instances since 2003. Declining instances are common with some studies - especially studies like this with a large number of instances. The issue has to do with repeat occurrences of the setup. Here we see there were 454 occurrences that showed up with a 1-day holding period. 77 times it happened twice in a row, so when you look at the 2-day exit results now your number of instances drops to 377. Looking out 5 days the instances drops to 246, meaning after the 1st instance there were 208 times where you again had a 1% drop during the 4 days following all "initial" instances. I do this to avoid double counting. When dealing with oversold statistics if you double (or triple, etc.) 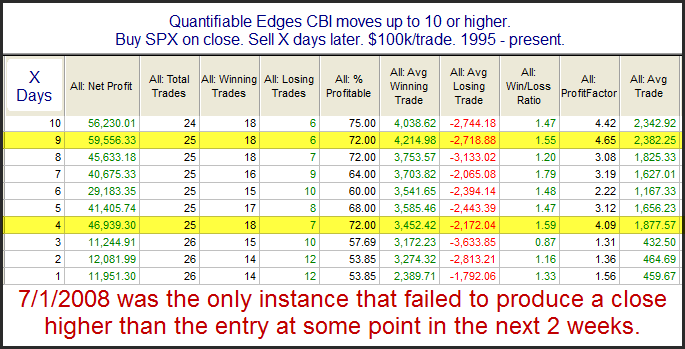 count them then your results will most often be skewed unfairly bullish. The 2nd instance you're more oversold than the 1st and the 3rd even more so. Now when the bounce comes it's being counted 3 times if you decide to track the stats on all 3. So when I run the stats on such studies, I make the assumption that the 1st time it triggers it puts you "all in" and your exit will be X days later. You can't get another buy trigger until the first one closes out. So there you have it - “The Mystery of the Declining Instances” is finally solved. "I would highly encourage readers looking to understand more about how the market reacts to Fed Days to take QE's book for a spin." Below is one volume-related study that appeared in last night's Subscriber Letter. I'll be speaking at the L.A. Traders Expo on Friday June 11th at 8am. The presentation is titled Quantifiable Edges for Trading Fed Days. I plan on discussing a fair amount of my research and findings from the new book, "The Quantifiable Edges Guide to Fed Days". The CBI closed Wednesday at 10, which is as low as it has been lately. This is now the 9th trading day in a row with a close of 10 or higher - a very long stretch for such an extreme reading. This raises the question of whether having such strongly oversold stocks take so long to bounce suggests anything. Is this failure of the CBI to drop back down a sign of more market weakness to come? 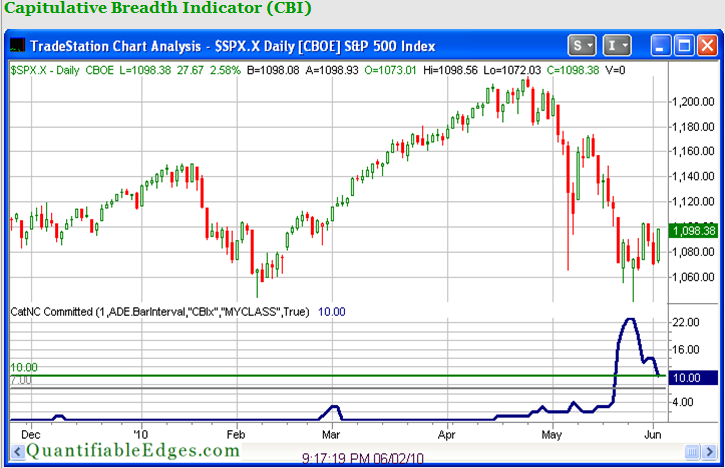 Or does it suggest that perhaps it is just taking some time to carve out a meaningful bottom? This past week I had the pleasure of interacting with Tom McClellan of McClellan Financial Publications (http://www.mcoscillator.com/). Tom shared a study with me that supported some breadth related studies from the Quantifiable Edges Subscriber Letter that I’d been discussing the last few weeks. Tom’s study looked to measure market risk when the A/D line was making new highs. To accomplish this he examined any time the Advance/Decline line made a 3-year high and then looked forward 3 months to see what the max drawdown was in the SPX. The SPX has not managed to make a 3-year high in the A/D line recently. It DID make a 2 ½ year high about a month ago though. So I re-ran the study with Tradestation data (which should be very similar) and used a requirement of a 2 ½ year high instead of 3 years. Note: A full year typically contains about 252 trading days. For purposes of this test I rounded that down to 250 and multiplied by 2.5 to get 625 trading days. To estimate 3 months I used a 63-day period. Also note that the flat spots on the chart are times when the high A/D condition is not met. As you can see above, since 1970 there has only been one instance that saw a larger drawdown over the following 3 months than we’ve already seen this past month. Other corrections were generally capped at between an 8% - 10% decline. This doesn’t mean we can’t drop precipitously from here. The market has demonstrated several times in the past few years that it is completely capable of breaking records. It does show that we’ve reached an area where risk has pretty much maxed out in the past under similar conditions – at least temporarily.